21 years young! Our staff at BreastScreen Queensland Brisbane Northside Service at Chermside took time out to celebrate this important milestone which has seen 324,000 women screened through the Chermside service since it opened its doors in 1997. Celebrating a 21st birthday is always something special and it is no different for the BreastScreen Queensland Brisbane Northside Service at Chermside. This week the breast cancer screening service celebrated with special guests including Mrs Glynnis Jones who was one of the first women screened in 1997 at the Chermside facility. Mrs Jones, who is a local resident of Chermside, has been screening with BreastScreen Queensland for almost 35 years. “I started screening in 1986 when the service was still in the Lady Ramsay building in the old Royal Women’s Hospital,” she said. “When they opened the Chermside Service in 1997, I moved to having my breast screen there and have been going every two years since then,” Mrs Jones said. Mrs Jones said she has always made the time to have her breast screen as she knows how important the women’s health check is. “Having a BreastScreen service right here in Chermside has made it so easy for me,” she said. State Member for Stafford Dr Anthony Lynham said the BreastScreen Queensland Brisbane Northside Service screening and assessment service played a vital role in the community and in saving lives. “More than 324,320 women have had a breast screen with the service in the last 21 years,” Mr Lynham said. “That means that thousands of women have benefited from having their breast cancer detected early,” Dr Lynham said. The service celebrated with a birthday party attended by past clients, and current and former staff, as well as Metro North Hospital and Health Service Board Member Ms Bonny Barry. 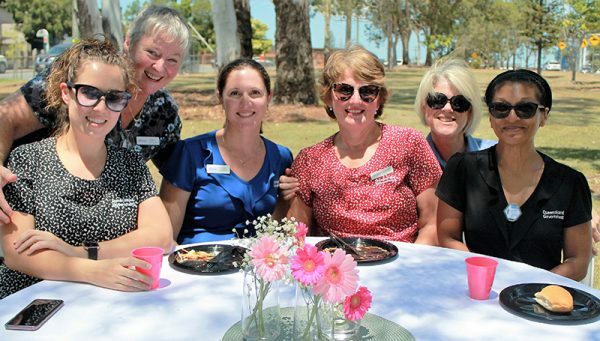 As a breast cancer survivor herself, Ms Barry urged local women to take advantage of the free BreastScreen Queensland Program. “Breast cancer is still the most common cancer diagnosed among Australian women and over 75 per cent of women who develop breast cancer are over the age of 50,” Ms Barry said. The BreastScreen Queensland program provides free, high-quality, breast cancer screening services to women aged 50 to 74 years. Women aged 40 to 49 and 75 and over are also eligible to attend. To book an appointment, simply visit breastscreen.qld.gov.au or phone 13 20 50.